Egypt's President Mohammed Mursi has issued a declaration banning challenges to his decrees, laws and decisions. The declaration also says no court can dissolve the constituent assembly, which is drawing up a new constitution. 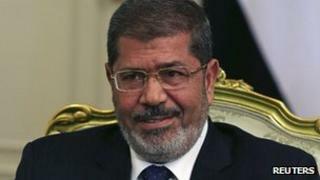 Egyptian opposition leader Mohammed ElBaradei accused Mr Mursi of acting like a "new pharaoh". In a joint news conference held late on Thursday, Mr ElBaradai and other opposition figures described the declaration as a "coup against legitimacy" and called on Egyptians to take to the streets in protest. The president may feel he has gained power through his role as international mediator in the Gaza conflict, but his latest announcement is likely to cause new struggles inside Egypt, the BBC's Jon Leyne in Cairo reports. Thousands of protesters have returned to the streets around Cairo's Tahrir Square over the past week, demanding political reforms and the prosecution of security officials blamed for killing demonstrators last year. He might be riding high in international opinion because of his role helping to secure a ceasefire between Israel and Gaza, but Egypt's President Mursi is still facing pressing domestic issues. Mr Mursi's announcement that he is sacking the unpopular public prosecutor - an appointee of his predecessor - and ordering the retrial of leaders of Hosni Mubarak's regime - is an attempt to satisfy the demands of the young "revolutionaries". Yet many will be alarmed by the extensive powers that the president has now granted himself - largely to see off ongoing legal challenges. The constituent assembly drawing up the new constitution - which is dominated by Islamists and criticised by secular political forces - is being given special protection to complete its work so that Egypt has a new governing document and can proceed to new legislative elections. But of most concern is the line that Mr Mursi's decisions "are final and cannot be contested". He starts to sound more powerful than the autocratic leader that Egyptians rose up to overthrow. Many feel that Egypt is missing political guidance, our correspondent says, and the appointment of a new prosecutor could be seen as an attempt by Mr Mursi to quell the protesters' dissatisfaction. But judges will view the decree as an attack on the courts' independence, our correspondent adds. Following the declaration, Talaat Ibrahim will replace Abdel Maguid Mahmoud as chief prosecutor. Mr Mahmoud's acquittal of officers allegedly involved in attacks on protesters led to violent clashes in Tahrir Square in Cairo in October, when supporters and opponents of President Mursi clashed. The president tried to remove Mr Mahmoud from his post by appointing him envoy to the Vatican, without giving an official reason for the switch. But Mr Mahmoud defied the Egyptian leader and returned to work, escorted by judges and lawyers. The new prosecutor is now tasked with re-conducting all the investigations led by Mr Mahmoud into the alleged attacks on protesters, and re-trying people already acquitted in the case. The declaration also gives the 100-member constituent assembly two additional months to draft a new constitution, to replace the one suspended after President Mubarak was overthrown. The re-write of the constitution, which was meant to be finished by December, has been plagued by dozens of lawsuits questioning the make-up of the constituent assembly. Once completed, the document should then be put to a referendum. If it is approved, legislative elections will be held two months later. The re-writing process had already been slowed by a court ruling in April suspending the first constituent assembly, amid accusations that it was dominated by Islamists. In June, political parties agreed on the make-up of a new panel, which included a range of politicians, members of the armed forces, police, judiciary and trade unions, as well as Muslim and Christian leaders. However, liberals continued to complain about the distribution of seats and have not withdrawn their 43 legal challenges to the assembly's constitutional legitimacy. The assembly has welcomed Mr Mursi's declaration, saying it would help put an end to the ongoing row over the panel's fate. But Mr ElBaradei said the decree effectively placed the president above the law. "Mursi today usurped all state powers and appointed himself Egypt's new pharaoh. A major blow to the revolution that could have dire consequences," the Nobel Peace Prize winner wrote on his Twitter account. The vice-president of the Supreme Constitutional Court, Tahani al-Gebali, told the Spanish news agency Efe that Mr Mursi was now an "illegitimate president". The Egyptian Judges' Club has called an extraordinary meeting to discuss Mr Mursi's decision. "The state of law is at stake," the association said in a public statement. Meanwhile Heba Morayef, the Egypt director for Human Rights Watch, said that while the country needed judicial reform, "granting the president absolute power and immunity is not the way to do it".